Adult/Children 1st and 2nd Prize! Coffee & Donuts are available Sunday, rain or shine, at the fountain area 8:30 AM til 9:30 AM. Please Join Us for a great cup of Joe! 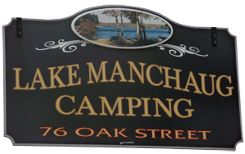 For information regarding Lake Manchaug Camping please contact us in Douglas, Massachusetts.